The aim of this study was to extract predictive factors of prolonged air leak (PAL) including air flow data as objective parameter by digital drainage system (DDS). The 372 patients who underwent lung resection and had continuous log data of air flow by DDS were reviewed. PAL was defined as the air leak which was exceeding 20 ml/min and lasting 5 days or more. The 69 patients (18.5%) showed air leak and were divided into PAL group (n = 21) and non-PAL group (n = 48). 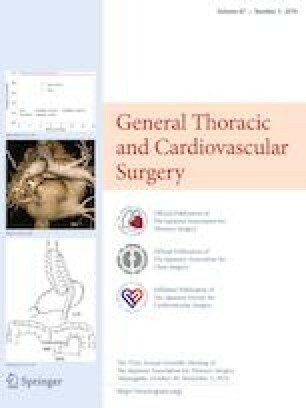 The average flow per hour was calculated at 0, 12, and 24 postoperative hours (POH) and the residual ratio of flow at 12, 24, and 36 POH to that at the time after surgery was analyzed with clinical factors. Area under the receiver-operating characteristic curve (ROC-AUC) was calculated to determine optimal cut-off value of PAL predictors. ROC-AUC for flow at 36 POH was 0.88. Sensitivity and specificity were 0.91 and 0.73 when cut-off value was set at 20 mL/min at 36 POH. ROC-AUC for residual ratio at 36 POH was 0.82. Sensitivity and specificity were 0.81 and 0.79 when cut-off value of residual ratio was set at 0.20. The air flow and the residual ratio measured by DDS will be useful predictors of postoperative PAL after lung resection. The online version of this article ( https://doi.org/10.1007/s11748-019-01073-y) contains supplementary material, which is available to authorized users.